One tool that continues to make IoT and industrial solutions easier is Node-RED. Designed and built by IBM, Node-RED is an free, open source logic engine that allows to programmers of any level to interconnect physical I/O, cloud-based systems, databases, and API’s. User interact with Node-RED via a browser-based flow editor that makes multi-device and multi-API integrations as easy as linking together nodes into easily understood flows. To learn how you can better leverage the flexibility and visualization of projects with Node-RED continue reading. In this article we will install and run Node-RED in a Raspberry Pi to quickly and easily develop and deploy your next IoT solution. IMPORTANT NOTE: This guide assumes your Raspberry Pi has been configured and is already connected to the Internet. If not yet configured, you can quickly do so using this quick start guide from the Raspberry Pi Foundation. 1. To start the installation, access the Raspberry Pi via your prefered method. This can be done using the Desktop Interface (connecting a monitor, keyboard, and mouse to the Raspberry Pi), or simply by accessing the Pi Remotely using your computer’s terminal as a secure shell, or SSH. 2. Once you have access to the Raspberry Pi, update the list of available packages and their versions to start your solution with everything up-to-date. Here you can reference the official documentation for a detailed explanation of this update command. 2. Once your image card has been updated, confirm the installation by inserting Y when asked for verification. Following the steps below we will configure the Raspberry Pi. Remotely from your Computer’s Terminal: Run node-red-start in a new Raspberry Pi terminal window. 1.1. Once the command is inserted wait a couple seconds until the Node-RED server starts running. As you can see on the image below the terminal logs lets you know the device IP and port where that the Node-RED server will be pointing. 1.2. 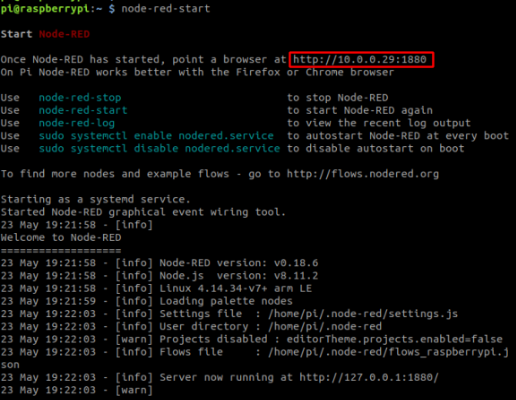 Once the Node-RED program has started, open a web-browser of your preference and in the URL navigation bar write the address shown in the first main line of your Node-RED terminal as captured below. 4. To stop Node-RED, run the command. Note: closing the window (or ctrl-c) does not stop Node-RED running. The program will continue running in the background unless you execute a -stop command. With Node-RED installed and configured in the Raspberry Pi, this Pi is now ready to handle different development flows. If you really want to make your solutions valuable to end-users, link your Node-RED data to the internet and use an IoT Application Enablement platform to enhance the raw data into insights as data driven applications that improve your business or operations. To learn how to send data to IoT App Enablement and Development platforms like Ubidots, check out this simple guide to quickly setup the data-communication highway form the Pi to the Cloud. Need more functionality? In the Node-RED documentation you can find new nodes available, share your flows, and see what other flows have been built with Node-RED.